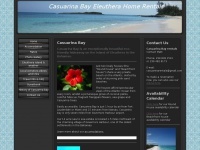 A profile of Casuarinabay.net was found on the social network Facebook. The web server used by Casuarinabay.net is located in Houston, USA and is run by Halliburton Company. On this web server 59 other websites are hosted. The language of those websites is mostly english. Only a few websites on this web server are x-rated.